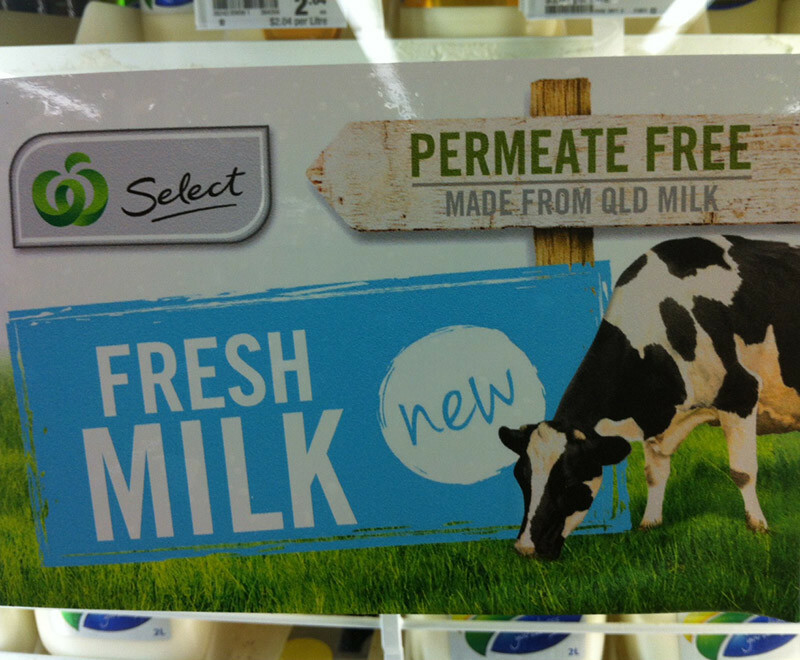 Before Dairy Farmers launched their permeate-free campaign, most consumers didn’t know (or care) about permeate. So when the campaign first aired (followed by the exposé on A Current Affair), I’m sure the entire design, marketing and dairy industries were poised – watching the supermarket shelves to see how long it took for competitors to respond. And to no surprise, the biggest players in the milk market (Woolies and Coles) confirmed that their private-label products would become permeate-free. And they sure didn’t disappoint. Label printers in Australia must have made record profits in the following months, because it didn’t take long before numerous brands were all milking the frenzy. What’s the benefit to Dairy Farmers? They knew some competitors were likely to copy. Dairy Farmers knew they didn’t own a long-term monopoly. There’s nothing they could do to patent the process (to stop competitors from making permeate-free milk). Actually, not adding permeate actually makes the process simpler. They admit that permeate isn’t bad. Even though permeate is a watery by-product, it is natural. The addition of permeate to milk reduces costs and eradicates the need to dispose of permeate. The Dairy Farmers website even states that permeate isn’t bad. Yes you heard right. The campaign would have been expensive. The cost to produce (a high quality) TVC, and air it on numerous channels (including prime time) is expensive. In addition, their competitors (who are now selling permeate-free milk) have benefited from the education of the community, and only had to pay for new labels. So given the above points, was there really any benefit to their shareholders or their brand? They were first-to-market, and so there was a short period where they owned the market. There were no competitors (or should I say there were no well-known competitors) who were making this claim. Even though they’ve been copied, some consumers will likely consider them to be market leaders. And by inference some will assume it’s the best product on the market. The media coverage of their campaign (and the permeate debate in general) has exposed their brand to millions. They’ve justified why their permeate-free milk is more expensive. What’s the benefit to consumers? You could probably say it’s the right to choice. Now most consumers know about permeate, and they can decide what they prefer. I’m hopeful that somehow it will result in full disclosure on all labels. Not just the marketing spin of “permeate-free”, but milk manufacturers having to disclose what percentage of permeate they re-add. Need professional designers? Call Creative Passion on (07) 3366 8166.